The book I’m featuring this week is The Accordionist by Fred Vargas, a book I reserved at the library and collected yesterday. It’s the third book in her Three Evangelists series. Louis Kehlweiler threw the newspaper down on the table. He’d seen enough and felt no urge to turn to page 6. Later maybe, when the whole business had calmed down, he’d cut out the article and file it. 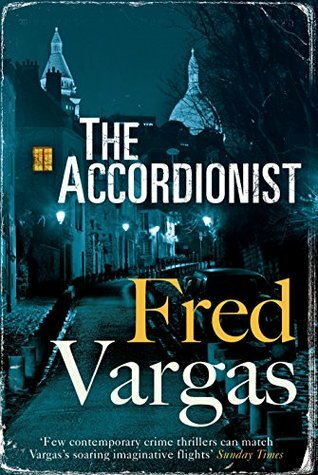 I’ve been looking forward to reading The Accordionist since I finished Dog Will Have His Day, the second book in Fred Vargas’ Three Evangelists series. I love her books. She writes such quirky crime fiction, with eccentric characters and intricate plots that I love and find so difficult to solve. I keep promising myself Vargas and then never get round to doing anything about it. Maybe this time! I would definitely want to keep going with this one, Margaret. I like Vargas’ writing very much, and I think she creates such interesting characters. She has a sense of wit, too, that I enjoy. I’ll be interested in what you think of this when you’ve finished it. With that title I wasn’t expecting that cover, but I like the sound of it. Happy Friday! I’m intrigued by the opening and by this series in general. I’m going to see if my library has the first book. This sounds interesting. I’ll have to look for the first book in the series. This week I am featuring Magic Triumphs by Ilona Andrews. Happy reading! The excerpts grabbed me…and now I want to know what happens. Thanks for sharing, and for visiting my blog. You had me at the Paris setting. Fred Vargas recently attended a mystery conference near me. I’m looking forward to reading more of her books. When I first saw the cover, I thought historical… I was surprised by 1997… LOL. Sounds very intriguing!! Happy weekend! Yep, I’d definitely keep reading. Curious about the series now. Well you know me…. it’s Fred Vargas so I would definitely read on. Will reserve this one from the library at some stage. You had me hooked with just that one, very first line! I have come across the name of Fred Vargas once or twice before, but have never really checked out either author, or her books, more closely. Your feature made me do this and I definitely aim to read one of her books very soon, although I think I am going to need to go back to the beginning of either series to do so, as the relationship between her characters sounds quite complex.